Like it or not, we’re all just a species of primates lucky enough to have evolved into creatures with highly developed brains. 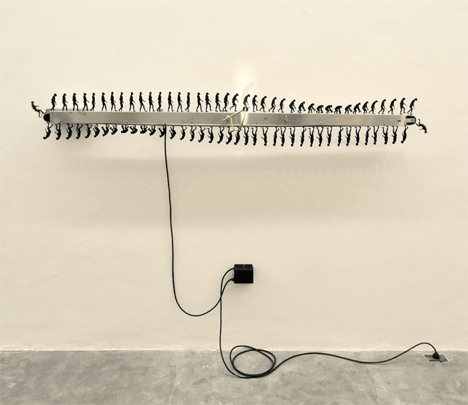 Lest we forget our roots – and our speculative future – Argentinian art group DOMA created Involucion Primate, a simple but elegant sculpture. The installation depicts our rise from primitive primates to the modern human forms we take today. But it then continues to illustrate our eventual devolution back to a more primitive form. Small black figures march along a revolving belt, creating a never-ending parade of evolution and devolution. At the midpoint of the belt’s travel across the top of the sculpture, a light illuminates one figure at a time. 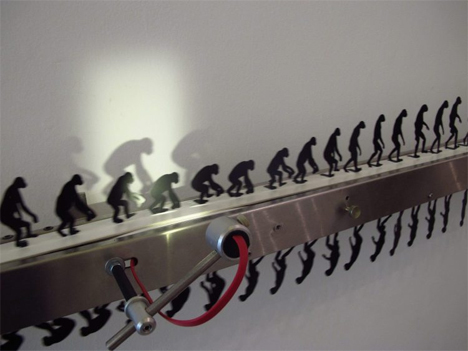 In the right conditions, this creates a rather beautiful shadow display of the sculpture’s primate subjects, marching one after the other through the inescapable cycle of changes.